01 October 2016, at 1:00a.m. Katy Smith of Royal Canin details the science behind her company’s new range of diets. WITH 35% OF CATS AND DOGS experiencing, or at risk of, multiple health conditions, providing the correct diet that meets all the needs of a pet can be problematic and can result in vets having to choose the condition that takes precedence when deciding upon a nutritional solution. 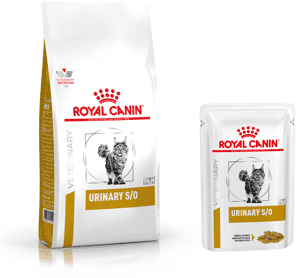 Earlier this year, Royal Canin launched Multifunction, a new diet range for cats and dogs that addresses multiple nutritional priorities. Each of the new diets was developed combining Royal Canin’s scientifically proven Veterinary Diet formulae. They include the Renal + Hypoallergenic (GFR-AFR) diet, the Urinary + Hypoallergenic (S/O-AFR) diet, the Urinary + Satiety (S/O-Kcal Control) diet, the Urinary + Calm (S/O-Bipeptide) diet and the Mobility C2P+ + Satiety (C2P+-Kcal Control). The Renal + Hypoallergenic diet is recommended when a pet has a renal disorder such as chronic kidney disease (CKD) concurrently with a dermatological disorder including adverse food reaction (AFR), and/or a gastrointestinal (GI) disorder such as inflammatory bowel disease (IBD). It is a major concern for vets (and their clients) that have previously stabilised an AFR patient with a hydrolysed diet if that patient then goes on to develop CKD. The Renal + Hypoallergenic diet was developed as a dietary solution and is key in the management of both CKD and AFR, giving the dog or cat all of the benefits of a low molecular weight hydrolysed diet (hypoallergenic) with a restricted phosphorus and adapted protein content diet (renal). The Urinary + Hypoallergenic diet is recommended for pets with lower urinary tract disorders that also suffer from food-responsive dermatological disorders, and/or certain GI conditions. It was developed due to the importance of dietary management in the treatment of animals with recurrent struvite and calcium oxalate urolithiasis that also suffer from AFR, combining all the benefits of the existing S/O range (struvite dissolution, urine dilution and low Relative Supersaturation) with a hypoallergenic diet. Environmental changes are a well- recognised risk factor of feline lower urinary tract disease (FLUTD), which is why the Urinary + Calm diet was developed. The diet is recommended for adult cats that are prone to developing FLUTD and addresses many of the risk factors associated with the disease. The calm diet contains serotonin precursors as well as alpha-casozepine, which has proven effects on anxious cats and has been developed for animals that are facing environmental challenges such as conflict, home relocation and indoor living. The urinary component of the diet is a moderate calorie formulation, as many FLUTD patients have a tendency to be overweight. It is also available in a wet formulation and, as such, is particularly aimed at patients with feline idiopathic cystitis (FIC). Obesity has detrimental effects on the health and longevity of dogs and cats and, among numerous other conditions, predisposes them to urinary disorders. Studies show that the prevalence for urinary disease in obese and overweight cats is higher than normal and underweight cats, which is the rationale for the development of the Urinary + Satiety diet. This diet is recommended for animals requiring weight management (including diabetes mellitus when BCS is 6 or above) or animals that have obesity disorders, such as hyperlipidaemia, that also have a lower urinary tract disorder. 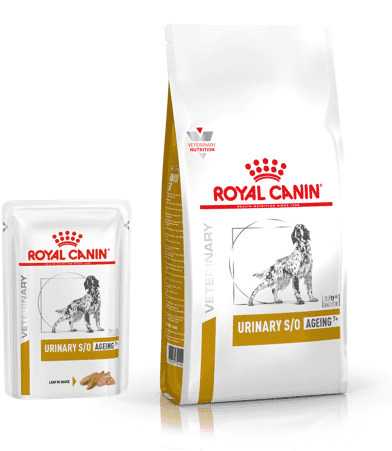 A patient at Colne Valley Veterinary Practice was recently treated with the Multifunction Urinary + Satiety diet. Charlie, a six-year-old cat, historically suffered with cystitis. He was originally managed on the urinary S/O diet; however, he also struggled with his weight, tipping the scales at 7kg. Transition to a moderate calorie urinary formulation (S/0 moderate calorie) resulted in a 1kg weight loss over a six-month period. However, Charlie’s weight loss plateaued and the owner noted that he seemed hungry on his daily ration but was concerned about moving to a specific weight loss diet, in case his previous clinical signs associated with cystitis returned. It was then that Charlie was trialled on the Urinary + Satiety diet. After two months on the diet, Charlie’s weight dropped to 5.6kg with a BCS of almost 5/9. His owner reported that not only was Charlie a healthy weight again, he also seemed a lot more satis ed on the new diet and is now back to his old happy, playful self. The nal diet in the multifunction range is Mobility C2P+ + Satiety, aimed at dogs that are overweight but also need joint support to maintain mobility. Obesity or excess weight is one of the acknowledged risk factors for joint disease.2 This is not only because excess weight incurs excessive pressure on joints, but also because adipose tissue is recognised as being metabolically active and pro-inflammatory. The diet combines the C2P+ joint complex, a synergistic complex of curcumin, hydrolysed collagen and green tea polyphenols with a high protein content (to maintain muscle mass) and an adapted fibre blend (increases gastric volume) to promote satiety during the weight loss period. The Multifunction diet range is exclusively available through selected Royal Canin veterinary practices with personalised packaging. For more information, veterinary professionals can contact their local veterinary business manager. 1. Beata, C., Beaumont-Graff, E., Coll, V., Cordel, J., Marion, M., Massal, Marlois, N., and Tauzin, J. (007). Effect of alpha- casozepine (Zylkene) on anxiety in cats. Journal of Veterinary Behaviour Clinical Applications and Research 2 (2): 40-46. 2. Budsberg, S. C. and Bartges, J. W. (2006). Nutrition and osteoarthritis in dogs: does it help? The Veterinary Clinics of North America. Small Animal Practice 36 (6): 1,307-1,323. 3. Defauw, P. A. M., Van de Maele, I., Duchateau, L., Polis, I. E., Saunders, J. H. and Daminet, S. (2011). Risk factors and clinical presentation of cats with feline idiopathic cystitis. Journal of Feline Medicine and Surgery 13 (12): 967-975. 4. Lund, E. M., Armstrong, P. J., Kirk, C. A., Klausner, J. S. (2005). Prevalence and risk factors for obesity in adult cats from private US veterinary practices. Intern J Appl Res Vet Med 3 (2): 88-96. 5. Survey conducted with practising vets in France, UK and US (n=370) for Royal Canin in 2013. Data for UK (n=120) and France (n=122) averaged to represent Europe.